Want to follow me on Twitter and Tumblr? Of course you don't. I don't use either one. As readers may know, I enjoy providing the blogosphere with invaluable and cutting-edge information that is relevant to every single second of your lives. In the spirit of holiday giving, I am providing a preview to what many of the blogs will be doing in 2013. In my sleuthing, I have procured many articles, drafts of posts, ideas and outlines that many of my favorite blogs are planning to release. Though I won't scoop the entirety of each post, here are some unauthorized previews of what you can expect from each blog. The Trad - Tintin will begrudgingly attend a fashion after-party in Brooklyn where he will finally violently pummel an entire group of post-hipster 20 and 30-somethings. Afterwards, he will apologize to them and take close-up photos of the tags in their shirts and remark that "the wine wasn't bad". The young beautiful-but-vapid model he will chat with says that her father was in the Army (but in Canada). Tintin's ensuing sarcasm will get him slapped, but he will post pictures of his reddened cheek. The Daily Prep - Muffy Aldrich will ask readers to weigh in on which brand of garage door grease is the most preppy and why. High-resolution photos of the garage door will be included. In the comments section, a reader will ask Muffy which brand of dental floss she finds to be the preppiest. Maxminimus - The doting father with a vast shoe collection will post about the pair of shoes that got away on a missed opportunity in 1986 and he'll somehow have photos of them. In the post, he'll use "patina" and "wallup" in a single sentence and will combine "ain't no telling" into "aintnotellin'". In the background of a photo for another post, readers will be able to clearly see a notebook page on which ADG has repeatedly doodled "Mrs. A.D.Flusser" in pink and purple ink. The Mainline Sportsman - In early 2013, the Sportsman will bring us photos and descriptions from his hunting trip to a lettuce farm where he will bag seven or eight heads of Bibb with a .30-06. He will also reveal that Christmas was "an odd experience for the family this year", and will without explanation post a recipe (with photos) of very fresh reindeer steaks. To The Manner Born - Toad will attempt a home-improvement project which he will be unable to complete himself. He will still claim to be a stodgy, technologically challenged Luddite, though he has kept a vibrant blog and internet presence since at least 2008. Mr. Midwester - Through a legal loop-hole in the fine print of his popular Style Share series, a reader will lay claim to the actual house pictured in the photo's backdrop meant to show only the silk tie in the foreground. The claim will be enforced in a Midwestern court. Reggie Darling - Saucers. Lots of saucers. Tons and tons of f#@%*ing saucers. The Easy and Elegant Life - The Elegantologist's first post of 2013 will include a synopsis of his legal battle to acquire the exhumed DNA of Cary Grant. He will be arrested a week later when police catch him emptying a vial of replicated DNA into the local water supply while whispering "C'mon, damnit... WORK! It has to work!" An Affordable Wardrobe - It will be revealed in his final post as he signs off forever, that for all these years, Giuseppe actually went out and purchased everything new and at full retail prices. He will half-heartedly ask for our understanding, but will conclude the post with "You all forced me into this". The Cable Knit Charlestonian - Mr. Alexander will be mixing patterns with reckless abandon, and will begin to show not only his eBay purchases, but will expand into photos of grocery shopping, drug store purchases, close-ups of things that he finds in his pockets, and whatever sticks to the bottom of his shoes. Brohammas - Through his career in visiting academic institutions of scientific innovation, Mr. M will slip into one of the college laboratories and accidentally be cloned, producing ten exact copies of himself. All ten copies will then form a private club and hold regular meetings. Despite all of this, when he is invited to attend, Mr. M will report that he "felt like an outsider who didn't really belong there". Boxing The Compass - The usual crap, only somehow worse. ***Full Disclosure - Prior to writing this post, I contacted each blog listed here. I only wrote about those who offered their blessing, and you'll be happy to know that each blogger did. Lady Aldrich astutely titled it "A Christmas Roast". I thank them and sincerely appreciate their friendship, and in many cases, their generous hospitality. A client and I were enjoying sushi together the other day when this arrived at the meal's conclusion. Said client pointed out that he himself is a business opportunity, and that he was in fact, in work clothes (a smart navy-blue suit). "That makes me a problem, I guess" was his logical conclusion. "Better have another drink" I said. "Here's to alcohol dealing with your problems" he said as he raised his glass. Helluva guy. I sat and stewed about whether or not to write anything about Dave Brubeck for a day or two, and then decided to give it a try. I'll keep it short. My father introduced me to Dave Brubeck when I was a child (not a personal introduction, but an introduction to his music). He'd play the albums for me and taught me to count out the odd time signatures. I would try to follow and understand Joe Morello's rythyms, both the elegantly simple (Unsquare Dance) and the subtly complex oscillations of time (Three To Get Ready). Although Take Five has long occupied the space somewhere between staple and cliche, I still love it. Father had (still has) all of Brubeck's albums on vinyl, and I played them in succession, learning his style along the way. His West Coast musical style was warm, clean, optimistic, academic, approachable, and free of the depression and drugs of the East Coast sound. I loved it. In highschool, my parents bought me the cassette of Quiet As The Moon, and I instantly recognized Joe Morello's distinct drum style, until I read the insert and realized that the drums were played by Brubeck's son, in a style that was part imitation, part inspiration, and part tribute. We learn the things we do from our fathers, and our fathers' friends. Elementals was the first good honest attempt at blending classical and jazz. Today, it hardly sounds cutting edge, but it was when it came out. It's even more James Bond than James Bond. Dave Brubeck taught me the complex variations of style. He inspired me to take classical and blend it with modern in a fun experimental way. Though he taught me to not get too bogged down in the rules, he also demonstrated that one should damn-well know them and understand them. He also subliminally taught me to pay tribute to one's father, to follow his lessons, but to also adopt his style elements, first through awkward imitation, then self-exploring articulation, and finally through ingrained subconscious comfort. My father saw the Dave Brubeck Quartet perform when he was in college. I had always hoped to see Brubeck play to close the loop on the father/son cycle, but it sadly never happened. When I listen to it now, I still think of those hours, days, and years of listening to those albums with my father, counting out the time during solos that surely would stray, but never did. Father always encouraging me to explore further. I think about how Brubeck influenced both my style and my understanding of style, how it forms, and what it means. Experimentation, including abrupt or uncharacteristic departures from the norm create rich sounds for the ears and styles for the eyes. Occasionally, we miss, and sometimes we hit it just right. 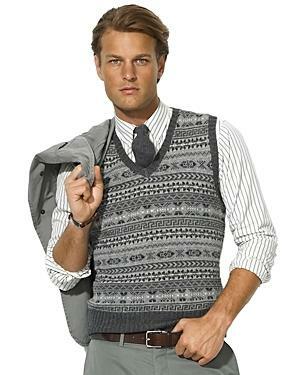 Am I the only one NOT enamored by the Fair Isle sweater? They're acceptable, but I can't seem to get my heart-rate up about them. I have one in a trunk somewhere, but I don't have the motivation to dig it out. Even though they've been around for the better part of a century, I'm lukewarm at best. Don't get in his van... the candy tastes like chloroform. After a brief stop at a California vineyard, I was amazed by the photos around the place; mostly by how cliched they all were. Apparently, it is impossible to show grapes of any sort without them having that morning dew look to them (though likely, it would be from the watering systems that vineyards set up). The wine was fine, but the whole vineyard experience in general is so overly precious that my eyes hurt from quietly rolling. When I got home to Boston (pre-Thanksgiving), I took my phone camera to the ivy berries growing on the west side of the house. Boston Ivy grows tiny beautiful-but-toxic berries in the autumn as the leaves begin to fall, and I decided to get VERY pretentious with some home photographin'. annoyingly about the sun and the soil. hackneyed crap for which I was hoping. Men's style and wine very often have many of the same types of players, and the faults are often identical. Recently, I was able to draw some parallels between behaviors I can't stand for wine or for men's style. -Not realizing that wine/clothing are components of socializing, and that the focus should be on the comfort of your guests or the conversation with companions, etc. Of course this list can apply to nearly anything; modern art and trendy food quickly come to mind. My (almost five year old) son indicated his displeasure recently at a gallery when he told a staff member that "it looks like just scribbles and trash". He was right. I have always been an advocate for calling crap crap, even if you are the only one who thinks so. The lone voice of dissent often kindles courage in others, occasionally resulting in a small vocal faction correctly yelling bull$h!t at the emperor's new clothes. By the end of summer, the drink signal becomes sun-bleached, mildewed, tattered, and generally ratty. I order a new set in the early spring each year (couple of dollars only) and start afresh. A long-standing ritual in my family and house is that we dispose of the old one in solemn ceremony (in other words, we throw it into the fire haphazardly while drinking liquor). During warm months at 5pm, we fly a cocktails flag outside of our city house, and welcome in for drinks anyone who presses the bell... anyone... which has been interesting. I am the sixth generation to conduct this strange tradition, though the original burgee didn’t make it past the second. It becomes an open house for anyone who has the gumption or friendship to press the bell. You are invited up and given a drink. Like generations before me, this 5pm open-door policy has resulted in some hilarious/interesting afternoons. In some cases, it has been attended by the parents of friends who used to frequent the same event hosting by my parents and grandparents, long before my time. We packed into the Sail Loft (a favorite sailor's pub) and we were able to fill the boxes with eighty-eight coats, plus hats and scarves. The quality of coats was astounding and humbling (noted and appreciated by the organization's representative who attended). I can't thank those who attended enough, and for those of you who emailed me telling me about your local donations. A thanks to all of you and your generosity. Of note was one young woman who had no extra coats at home, so she went to a local store and bought six new children's coats off the rack. We had a diverse turn-out, and I'm deeply grateful for all who attended. Phillip (a regular commenter to Boxing The Compass) and his wife were instrumental in the effort, and it would not have happened without them. Bay Cove is directing these coats to programs assisting people in entering or returning to the workforce. I do believe that enabling those who are able to participate in commerce of any sort will benefit everyone. The large number of children's coats will likely be distributed within hours of me writing this. I was in Philadelphia last week, and though the Mainline Sportsman was down for the count with the influence of influenza, I was able to have a perfectly pleasant evening with the gentleman behind the blog Brohammas. We talked away the afternoon and well into the evening, and he was as adventurous with his willingness to eat strange foods as I was. He's built like a fighter from rugged Western stock and judging by his build, he was likely an acute terror to his rugby opponents. Saddled atop his concrete shoulders is a highly intelligent mind and an approachable personality. A dedicated father and husband, he embodies the good side of being analytical and the analytical side of being observant. We hit it off very easily. How does this tie into the coat drive? We talked for a while about barriers both real and perceived. Lastnight, the representative from the coat charity told me that clothing is actually one of the more significant barriers to entering into the job market. I will spare you my lecture about how local licensing and permitting deters budding entrepreneurs, but the clothing issue as a barrier is more real than I had realized as it pertains to the entry rungs on the ladder. A friend/co-host/organizer put this together for the coat-drive. Hope you can make it, or support one in your local area. We sat (by the fireplace after work, each with a glass of Scotch), and agreed that we wanted little to do with raising money that would only feed administratively top-heavy "charities". A coat drive was his idea, and I was immediately onboard. I've bitched about this before, I know. 100% of coat donations will be made available to those who need them. If you haven't worn it in two season, you likely won't miss it. In Boston, our subway system updated to electronic swipe cards several years ago. When I was in college, the fare was 85 cents which held unchanged for years. The Kingston Trio rightfully decried taxation, but griping about transit is never on my list of things to do. I still have many of the old tokens which are destined to become cufflinks at some point. If Charlie, who was named after the old song Charlie and the MTA (I was required to not only memorize the lyrics, but be able to sing them as a child... true story) is the quintessential T rider, I think we might be in good shape. Notice his suit's beautifully pressed pants with hefty cuffs, two-button jacket, and button-down collar. For some reason, he has contrasting buttons on the collar, but no matter, he's still well put together. He also travels with a hat and apparently a positive attitude and a predisposition for favorably rating that which surrounds him. Since our business districts are still very formal (especially the financial and legal sectors), it's no surprise Charlie is well dressed. When he goes casual, all may be lost. Stay well-dressed, Charlie. Start by wearing something normal. where ties are somehow required or normal on campus in the year 2012.
who can be counted in for any pick-up game on the fake quad during a picturesque autumn. The rugby shirt will protect the tie and shirt, I suppose, if that ambitious kid tries to tackle you. "Damnit, Clayton! I said two-hand touch! I don't want grass stains on my chinos!" Now, it's back to the main campus hall where jackets are also mysteriously required. Not enough time to remove your rugby shirt? No problem, put your heavy herringbone tweed (with severe taper) over that. Alternative: corduroy jacket with elbow patches for more allusions to mythological academia. Rumpled? Check. Carefree? Again, yes. Uncomfortable? Horribly. which is over the rugby which is over the sweater which is over the shirt. Should there be a dusting of snow, a quilted jacket (practically a uniform these days) can be put over the whole thing. It looks stupid, you say? Correct. While the layers may bring your internal temperatures to a near-boil, you can at least be comforted knowing that you are unable to move beneath it. hoping that you get photographed by someone for a blog. and I'm in my mid-to-late thirties. Now you are ready to stand unnaturally contrapposto, hold a football or bundle of books like Doryphoros, or gaze stoically with your chin and heavily combed hair aimed at the horizon. and let's not even talk about socks, the ubiquitous Jolly Roger, or the false sizing labels. This is not the first time I've humiliated myself for the blogs benefit. When the barometer drops, so does our courage. Boston was not hit hard, yet the "courageous" leaders saw fit to cancel just about everything. Schools were empty, the financial district was a ghost town, and subways and buses were yarded. This criticism extends to both private and public sectors, and to the the well-honed panic mechanisms in media who work everyone into a panic. It was really the tsunami in Japan that made me realize that we are collectively, not the group we thought we were (or say we are). As individuals, we may be resilient and self-reliant, but as a group, we are panicky dooms-dayers. After the tsunami, the citizens of Japan pulled together and self-governed in the way that we wished we were capable of, and it was then that I realized that we were in denial. The financial sectors in my city shut down as did most retail. Yesterday, it was only the new citizens who had the backbone to open their businesses and to keep the gears of industry turning. People who started businesses against all odds and oceans and green-card red-tape were standing behind their counters, ringing cash registers, etc., while the MBA's from the "best schools" cowered at home hoping that Skippy's treehouse would survive the wind and debris, and that their ESPN feed would not cut out. We did not keep calm and did not carry on. Commerce halted and our fragile spirits quivered. Children were kept inside parked in front of televisions and parents called one another to foment panic and anxiety. Don't wait for the city or town to clear the downed tree. Don't wait for the cavalry or for Superman or for someone else. Pull it together, organize your crumpled neighbors and get things moving again. Take your ax chainsaw, two-way radios, canoe, water filters, and anything else you have and put it to immediate use. And for God's sake, save the generators for those who have medical needs requiring electricity, not for your damn coffee maker. Unfortunately, communities often discourage self-reliance with radio and television telling us that it's too cold/wet/hot/humid/windy/dangerous/whatever to go outside. If we're outside, we can't be in front of the TV or radio, and we will realize that it's never as bad as we are told. There are plenty of people for whom the storm did much damage and do need a hand. There is a reason that the early colonists didn't build their houses on the beach. I had a conversation with a friend over at FEMA and one at NYC Transit. They shed some light on it in a way I hadn't considered. One told me that his theory was that people (governments and private sector) not actually in danger (Boston during the Hurricane) feel collectively left out of the action and want to feel like they are involved in either suffering or saving. I think he's right. Why spend time worrying about others and possibly feeling helpless or guilty from one's own inaction when you can trump up your own involvement to the point where you feel justified not assisting others? Once again, the theme of selfishness and narcissistic obsession seems to explain plenty. New Jersey and NYC are pretty screwed and need help immediately. Many will need clothing as winter is arriving shortly.